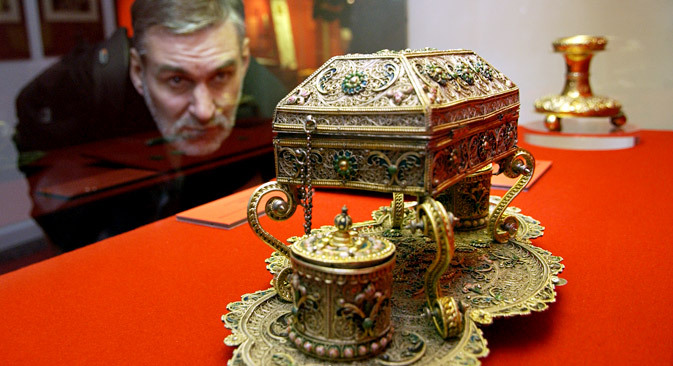 Moscow museum to exhibit its treasures in India, hold exhibition of Indian precious gems and jewellery. In a bid to broaden cultural links with India, the Moscow Kremlin Museum is considering a couple of initiatives in Russia and India, the museum’s director Elena Gagarina told Itar-Tass. The museum would like to bring its treasures for an exhibition in India, its director said, adding that she discussed the idea with Indian Culture Minister Chandresh Kumari Katoch. “We explained that we would like to hold an exhibition in India and invited the Honourable Minister to visit Russia to see our collection. We also requested Indian government to consider lending us several objects from the Nizam Collection, for the major exhibition of Indian jewellery to be held on Moscow in 2014.” Gagarina said. The British Museum and the Victoria and Albert Museum in London, the Museum of Islamic Art in Doha and other museums and private collections from different countries will present their exhibits in Moscow. “We’d welcome to see the exhibits from the National Museum in New Delhi. Talks are being held to present jewellery from the Nizam of Hyderabad collection. This is the unique project. Some of the exhibits will be exposed for the first time at the Moscow Kremlin Museum,” Gagarina stressed. The exhibits include the works of two major Indian jewellers – Munnu Kasliwal, who passed away last year, and Viren Bhagat, whose jewellery is so popular that the rich and famous queue up around the world to get a glimpse. In addition, visitors of the exhibition will be able to see the so-called Indian collections of leading French jewellers –Cartier, Van Cleef and Arpels, Chaumet and others. “Few people know that Indian Royals came to Europe with coffers full of precious gems. The part of gems was used to manufacture precious jewellery and the part of them was used as payment, and later set in jewellery” Popov said. Many world museums showed interest in this exhibition. “We are ready to present the exhibition in other countries and possibly in Delhi. This possibility is being discussed now,” Gagarina said. The exhibition will be held from April through August 2014. Diamonds were found and cut near the Golconda fortress located in the Andhra Pradesh state, in the south of India. Russian merchant Afanasy Nikitin was the first European who visited Golconda and mentioned it in his documents. The famous diamonds such as Koh-I-Noor, Darya-I-Noor, The Hope Diamond and the Regent Diamond were found there. The diamonds fields bore wealth to Nizam of Hyderabad (they ruled from 1724 to 1948). The last Nizam of the princely state of Hyderabad, Osman Ali Khan, 1911-1948, was considered the richest Indian on earth. In today’s values his estate is estimated to be worth 236 billion dollars.